Image 1: Elevation view of the project (Rendering by M. Stadler). 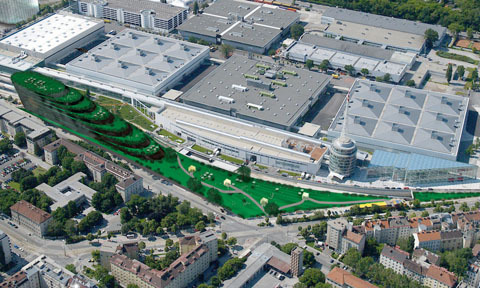 The exhibition center of Vienna required an extension located at narrow longitudinal region. We developed an energy concept so that the existing exhibition buildings could take advantage of the newly developed buillding. Many functions (shops, parking) of the new building were sunken on a subterranean level in order to create a beautiful entrance plaza for the existing exhibition center. Further away from the entrance, a series of green terraces lead up to a large open air cafe. Image 2: Top view of the project (rendering by M. Stadler). The top floors are used for housing, the lower levels are used for shops and offices. The subterranean levels are partially for parking and for shops. They are connected with the street level by glass boxes which act as entrances.